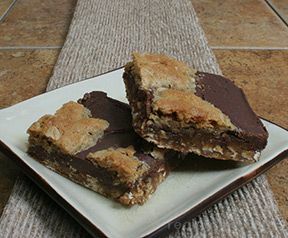 This bar has an oatmeal base covered with a rich fudge layer with nuts (if you like) then topped with spoonfuls of remaining oatmeal mixture. It's definitely a big crowd pleaser since it makes a jelly roll size pan and is a satisfying end to any meal. 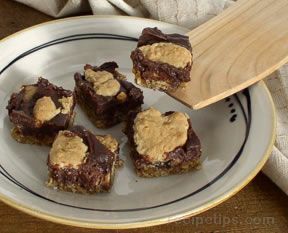 This recipe is easy to assemble and bakes fast. They freeze well, too! Blend in the eggs and 2 teaspoons vanilla. Add flour, soda, and 1/2 teaspoon salt until well mixed; stir in oatmeal. Spread 2/3 mixture onto 10x15x1 inch pan. 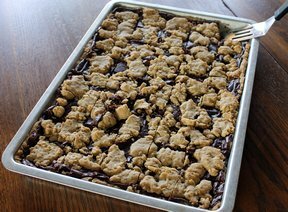 For filling, melt chocolate chips, milk, 2 tablespoons butter, and remaining 1/2 teaspoon salt in small saucepan on medium heat until smooth. Stir in nuts and remaining 2 teaspoons vanilla. Pour over mixture in pan. 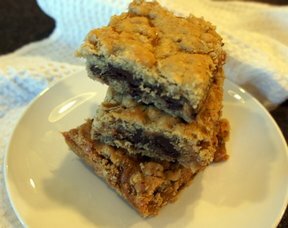 Dot with remaining oatmeal mixture. "This is always a hit! They start disappearing even before the pan has cooled. Rave reviews when I take them to family gatherings."